Yesterday evening I noticed a tweet. It was a retweet by a friend, of a message from someone whose daughter had left her iPod on a Virgin Train – which had arrived in London late yesterday morning. The tweet, which mentioned @VirginTrains, was asking for help in a general kind of way. Social Media scored an early goal. An impressive number of people picked up on the ‘general twitter hope’ sentiment which often adheres to these things. It cost them nothing but a moment to retweet, thereby prompting others to do the same, just in case someone had been on that train, or knew someone on the crew… it’s a long shot, “but you never know”. This was goodwill, expressed through and by a network of strangers or, by causal connection, friends of friends of friends. So what was the equaliser? One or two people had obviously made helpful suggestions, or asked questions, and the Mum’s replies showed that she had phoned Virgin Trains and got a pretty standard ‘You’ll have to wait until Lost Property opens on Monday’. This in itself is a classic passive, do the minimum, response. The Lost Property stance basically means, “…if somebody handed it in, you might be able to find the place where it is now held, and get it back”. This is in contrast to any suggestion that somebody goes the extra mile, identifies the train, current location, and has a quick look at the seats in that bit of the carriage – down the side of the cushion etc, etc. That’s disappointing. Maybe understandable if you think about the total volume of things lost on Virgin Trains over the average weekend. It’s also not a Social Media thing. But what is… is the clear absence of any kind of simple real-time listening by Virgin Trains. They are a big enough organisation to put this in place on a formal or informal basis. The Virgin Group also has a large media and internet arm AND a culture of personal helpfulness and intervention. A quick search of twitter for @VirginTrains showed the lost iPod tweets rattling through [along with another story of someone who had lost a wedding ring in the loo on a Scottish service] and also surrounding info which filled in the detail,that this was a 9-yr old girl, who had saved up her own money and gifts for 18 months to buy it, it was engraved, she had precious things stored on it, had always looked after it, was momentarily carried away by the excitement of a train journey to London, and that she and her Mum were very distressed. 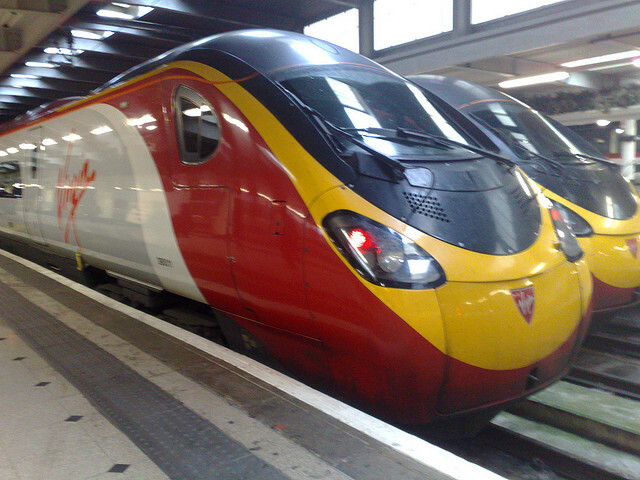 For my own part I’d assumed some professional listening and dropped in a couple of pokes in the ribs – along the lines that @VirginTrains could do better than ‘Monday… Lost Property.’ and invoking the spirit, and twitter handle, of Richard Branson. [Yeah… I know]. This was an opportunity for them to pull off one of those “publicity and goodwill money can’t buy” stories – especially in the wake of the franchise debacle – but it’s a non-starter if nobody is listening to the growing chorus of retweets. And the second goal against? When it became apparent that this was a 9 year old girl…there were quite a few posts on the lines of “What did you let a 9 year old have an iPod touch for”… can’t look after it, doesn’t know what it’s worth, spoilt, what do you expect, and so on. This really made me see red. Why, without bothering to empathise with the distress, or think about how people and families differ, would you bother to drop in a trite comment to that effect? You might think it, but why bother to inflict that on the mother? You’re not helping. Your moralising, even if you could be sure it was well-informed, is adding nothing. So why break off from commenting every few minutes on the hair and costume design in The X-Factor, to add your casual condemnation to the plight of an upset mother and daughter? So this will remain on my list of empirical psychological questions about the mind-set of Social Media. It’s not even about the fact that people jump to hasty negative conclusions about others, or that they feel justified in sharing these. It’s about why they bother to post rather than just ignore…. that they almost feel a duty to educate others against future folly. I could understand it if there had been offense or insult in the original tweet… but this seems like walking up to someone who is lying in the road, having been hit by a car [through carelessness or not] and saying “Why didn’t you look where you were going?”, before just walking away [possibly even delivering a sly kick to the ribs for good measure]. I’m sure most of these people wouldn’t do that. So what is it about Social Media that changes the rules? To be scrupulously fair to @VirginTrains , the twitter account itself makes it clear that they are around 8am to 8pm seven days a week – and offers a phone number for emergencies. The tweets started before 8pm, but I don’t necessarily expect a casual social sort of interface to be on its metal right down to the last minute. It’s more a question of where the overall brand listening is, or isn’t, happening for when some kind of social media balloon goes up… even if that’s automated, using frequency-based notifications and so on…? Meanwhile – it’s turned 8am, even with the clock change, so I’m off back to twitter to see if @VirginTrains seize the opportunity this morning. In the overall match, though, it’s 2-1 against my hope that Social Media makes a net positive contribution to a better world. Great blog Nick. Not very mindful of Virgin – or the tweeters who were moralising without bothering to ascertain all of the facts.